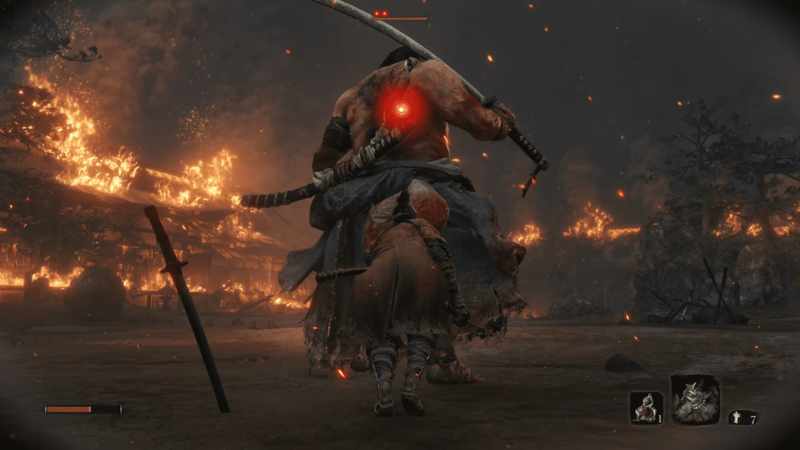 Let’s cut to the chase: here’s the easiest way to beat Juzou the Drunkard, one of the earliest bosses you’ll come across in Sekiro: Shadows Die Twice. First, sprint from the Main Hall idol to the outside of the boss arena. Don’t worry about fighting enemies, they won’t follow you. 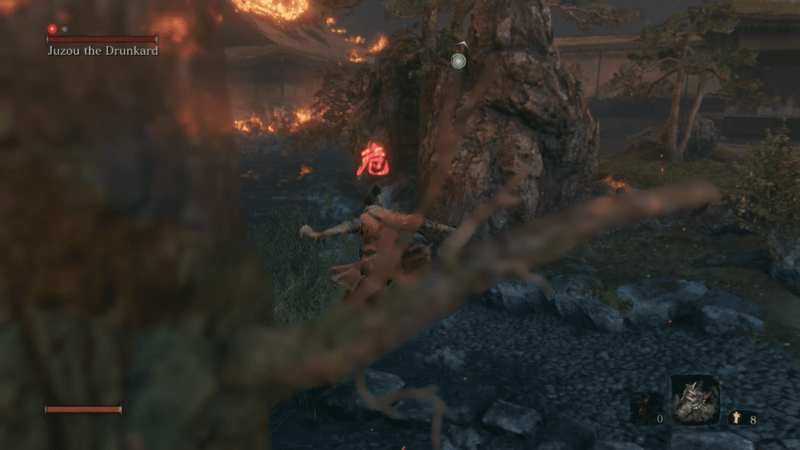 If you get targeted by fire arrows, duck in the tall grass or hide behind a rock until they leave you alone. 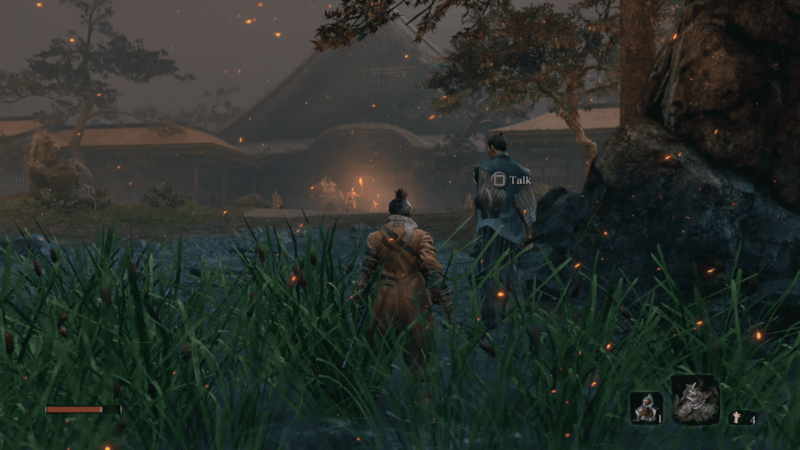 Next to the rock with a grappling point, note the man in a blue robe standing at the edge of the boss arena. His name is Nogami Gensai, but what’s more important is that he will help you fight Juzou. Do not speak to him yet. Nogami Ginsou stands on the edge of the boss arena, ready to help you fight. But don’t talk to him yet! Second, sneak into the doorway on the left side of the boss arena without alerting any enemies. 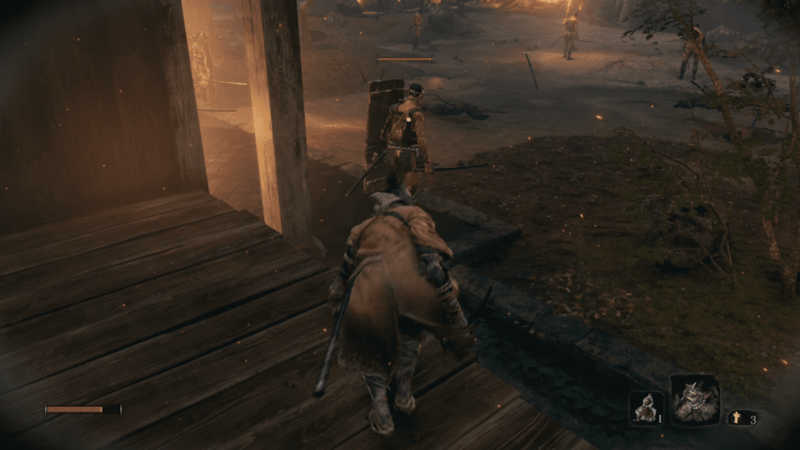 You can stealth kill the first enemy, and then instantly kill the second enemy standing in front of him before he can strike you. If you strike as soon as you finish the stealth kill, you can easily kill him without letting him hit you. Third, sneak through the doorway where the enemies you just killed were standing and through the hallway until the end. You will see two shield-bearers. Sneak behind one of them and stealth kill them. 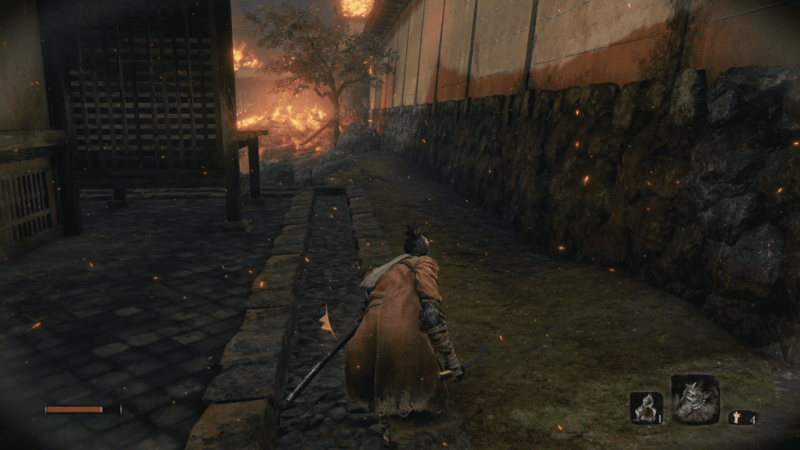 You will instantly draw the other enemies attention, including Juzou. Sprint back through the hallway the way you came, exit right through the doorway and crouch to hide behind the building. When you reach the end of the hallway, sneak up to this shield bearer and take him out. If you did this right, they should lose track of you quickly. If they try to follow you around the corner and get stuck on a loop of walking back and forth, sneak out of the boss arena and wait until you’ve lost them. Be careful not to alert the archers across the river. You can hide on the right exterior side of the building where you killed the first two enemies. 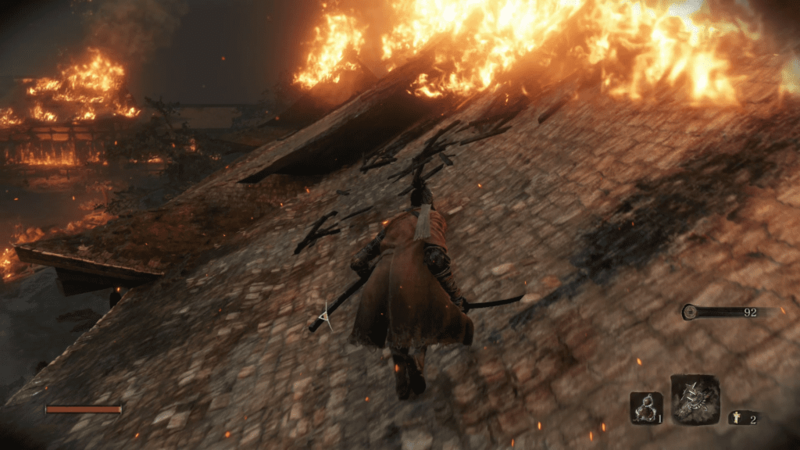 Continue sneaking through that hallway and stealth killing enemies one by one, starting with the other shield-bearer, then the archer, and so on, retreating every time. You may be able to get two in one go, but don’t risk death. This will take a while and requires patience. It might take more tries to get this part right than it does to defeat the boss himself. 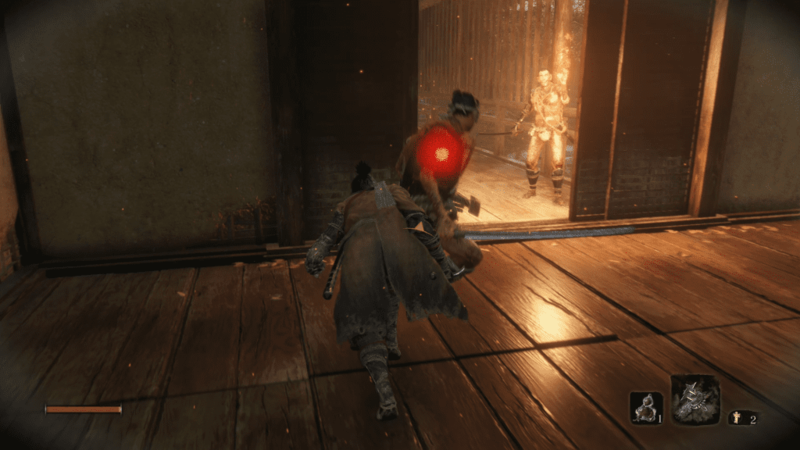 Once Juzou is completely isolated, sneak up on him and perform a stealth deathblow. This is where our friend in the blue robe comes in handy. Run towards him and speak to him (skip through his dialogue if you don’t want Juzou to come over and hit you while you’re talking) or lure Juzou over near him, in which case he will automatically rush into battle. Sneak up behind Juzou once he’s isolated for a stealth deathblow that will remove half of his health. After this point, the fight is easy. Juzou only has half of his health remaining, and he will spend much of the fight focused on your ally instead. That’s good! Let him target your friend and slice and dice him from his back. Be aggressive. Get as many hits in as possible while he’s targeting Nogami. If he targets you, either back off until he targets Nogami again or parry his attacks to break his posture and let your friend attack from behind. But you should watch out for some of his attacks. He will take a big drink of his flask and then spray it out at you. Run or dodge out of the spray or it will poison you. He can also drink from his flask to coat his sword with poison for a short time. When this happens, make sure to avoid those swings entirely. 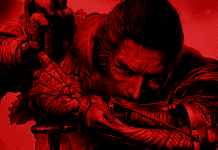 Two other attacks to worry about are his perilous attacks: anytime you see red kanji flash on the screen and hear the sound effect, try to dodge out of his vicinity. You can’t parry these attacks. If he reaches back, he’ll do a big sweep that you can avoid by jumping. If he reaches in to grab you, you can sidestep and get some hits in before he recovers. You did it: Juzou is dead! This is a very difficult boss fight if you try to rush him and his minions head-on, but it becomes relatively easy if you follow this technique. Have patience, take out his minions, get your deathblow in on Juzou, and let Nogami do as much of the work as possible. You can do it! 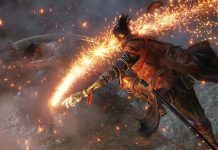 If you appreciated this guide, consider subscribing to the Spiel Times on Twitter, Instagram or Facebook for your Sekiro: Shadows Die Twice fix. Our full review is coming soon.